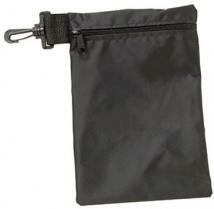 The 6"x10" Golfer's Pal clip-on pouch pleases the gallery year in and year out. 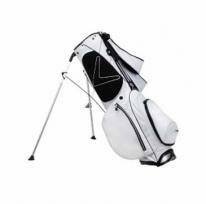 Store everything from tees and balls to a rain poncho inside without crowding your golf bag! A sleeve of golf balls and some accessories can make this the perfect kit for your tournament! Imprint Size: 4 1/4"X 6" Note: Additional color available, call for pricing. Made Of Nylon Ripstop Adjustable Waist Strap 52" Maximum Belt Size Inside Mesh Pocket, 3 Zippered Pockets 1 Front Pocket, And Side Cell Phone Pocket Padded, Mesh Lined Back. 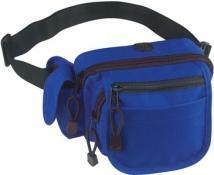 Approximate Bag Size: 8" W x 5" H Imprint Area: 2 1/2" W x 1" H Packaging: 50 per carton @ 28 lbs. Choose from Titleist, Maxil, Authoritee, Slazenger Select or Eco golf balls! Great tournament give-a-way. 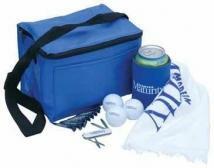 Pack contains 6pk Cooler Bag, 3 Golf Balls, 9 2-1/8" Golf Tees, Golf Towel, Multi Function Knife, and Collapsible Kan Cooler. 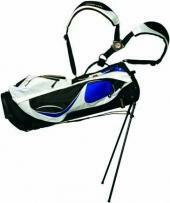 Price Includes: One color imprint on each item in the pack, 1-4 color imprint on one pole of the golf balls. Please Note: Items ship inside cooler bag, These items require an additional 2 day production time when Authoritee, MaxFil, Slazenger Select, or Dixon Earth-Ed Eco balls are slected. When Titleist balls are selected, production time varies with golf season, usually 10-14 days after art approval. PMS color match not available. Less than 1st column quantity not available. Price per pack. Other golf ball moedls available; call for a quote. 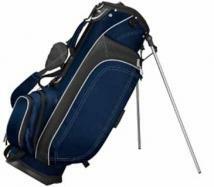 If you have any question in regard to the material, color or design, we highly recommend you request a sample of the golf kits before placing an order due to variations in color of kit components. Imprint Area: 6 pk. Cooler Bag: 3'h x 5" w Golf Balls: 7/8" diameter Golf Towel: 12"h x 6"w 2-1/8"Golf tees: 7/16"h x 1"w Collapsible Kan Coller: 2-1/2'h x 3"w Multi Function Knife: 3/8"h x 1-1/4"w. Packaging: Bulk Shipping Weight: 20 Shipping Quantity: 20. Patented OneUp Dual Strap System Lightweight construction 7-way organizational top with full length dividers Made with water repellant material Convenient water bottle holder Full-length apparel pocket Waterproof valuables pocket Five spacious pockets in all Umbrella holder Rainhood included Custom designed glove holder bar Easy to use elastic towel holder. Pack/Weight: 5 Lbs. Unit Size: 34"H Imprint Size: 4"W x 3"H. Packaging: Individually Boxed.